A comparison review of the dyneema Gorilla and Kumo. I was in need of a durable backpack here in the Olympic Mountains. Also the ability to carry water and snacks in the many pockets; was a huge bonus for me. Strong enough material to carry up to 2 weeks of food comfortably on my shoulders. When my son and I do trips; wanting to fit extra items into my pack to keep weight out of his. Just finished my second full hiking season carrying the Gorilla. Spent over 100 nights in the wilderness within that time. Carrying 14 days of food w/ Bear Can & Ice Axe last year. Then 10 days of supplies w/ tripod & camera gear this season. Encountered 4 season conditions while on and off the trail. Snow, Rain, Wind and brush were not uncommon, even swam across a river last year wearing the pack (not recommended). None of the contents in the internal compartment ever received moisture, even tho the backpack is not rated as waterproof. This option is a must for a backpack. Sometimes you have a lighter bulky load, so no need to carry weight on the hips, other times you don't. Just take it off the pack complete using velcro attachment point. I find a more natural stride can be achieved without the weight stuck to my frame. This is why I prefer not to wear a hipbelt during lighter loads. Other times you want to set up camp and go off exploring later in the day. Leaving the belt in your shelter is a nice option, then go have fun. Big pockets on the belt, make it nice for carrying snacks and the zippers keep everything inside. 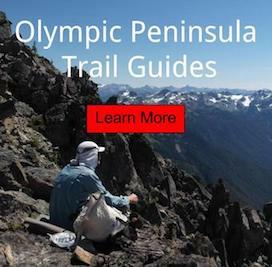 7 day backpacking stretch in the Olympic Mountains. Average gear list for 2013, varied by conditions and area traveled. This pack is the little brother of the Gorilla, slightly smaller in every way. Excluding depth, girth and pockets, but the design is the same, with the exception of an unremovable hipbelt. I chose to cut the waist strap completely off right away; since having no plans to carry any loads greater than 20 lbs with this pack. Gossamer Gear has newly told me that they have a new option for the Kumo and now has hip pocket features; for an additional fee. Note: The GG Sleeplite, is the only bed pad that I've gotten to fit. If you chose to use it for the back framework of your Kumo. The Kumo loaded for 3 days in the Dosewallips in spring conditions. When do I use the Kumo? When do I use the Gorilla? The Kumo is smaller, this means the depth and girth dimensions are lesser of the two. I can easily stuff a Sleeping Pad next to my things inside the Gorilla, but with its baby brother; I can not. However the littler guy gives you more comfortable ride, because of how slightly closer the load is to your core. Note: I have been using a GG Sleeplite and Thinlite pads for 4 season conditions. Using two foam pads are a challenge in the Kumo, without strapping one to the outside of the pack. Use the Gorilla for 4 season camping in this situation, unless I choose to use my air mattress. Update April 2015: Gossamer Gear no longer produces the Dyneema version of the Gorilla and Kumo. Read the 2015 Robic Kumo Review - and - 2014 Gorilla Review. Disclaimer: I am a Trail Ambassador for Gossamer Gear; was underneath no influence for this review.